There's a lot of Justice League deleted footage locked up in a vault at Warner Bros., and it's doubtful it will ever see the light of day. Many DC fans are hopeful that the Snyder Cut is real, and will arrive sometime in the near future. But the actuality of that happening is bleak at best. Well, today, we do get a look at one deleted scene that has been talked about before. 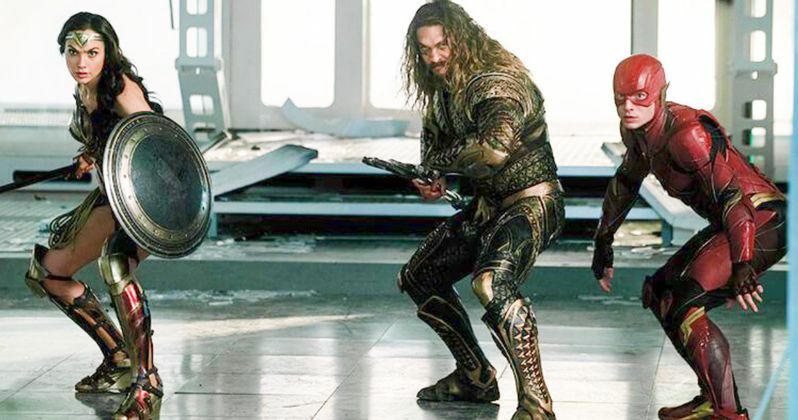 A new image has surfaced, and it features Wonder Woman, Aquaman and The Flash ready for a fight at STAR labs. Random photos from random sources have been popping up a lot lately. Just last week a brand new photo of Superman arrived on Twitter. It was believed to be from Zack Snyder's mythical cut of the film, and featured Henry Cavill without his CGI lip, before he grew out his mustache for Mission: Impossible 6, which notoriously had to be erased after reshoots. Now we get this new scene depicting half the Justice League team ready to throw down in STAR labs. The superhero adventure is one of the more notorious productions as of late, edging in front of Lucasfilm's Solo in terms of its production woes. As we get further away from Justice League's release date in theaters, we continue to get a better look at what could have been. Zack Snyder was the original director of Justice League, shooting the ensemble superhero adventure after establishing Superman in Man of Steel and bringing Bruce Wayne back to the big screen in Batman V Superman. But the production was troubled, especially in the wake of BVS's lackluster reception at the box office. Snyder eventually stepped down, claiming he had to take care of a family tragedy, as Avengers director Joss Whedon stepped in to rework the story and finish reshoots. Whedon is mostly responsible for what fans saw in theaters. What they didn't see was this scene, depicted in the photo below, which comes from Twitter user Kevin MIranda. It's unclear how he got his hands on it. While STAR labs was featured in Justice League, no fight ever takes place inside. It is believed that the scene comes from footage Snyder shot, not Whedon's reshoots. A recent rumor claimed Zack Snyder was busy compiling his Snyder cut without the help or approval of Warner Bros. Storyboard artist Jay Oliva called that fake news, though did admit that there was an early cut used to show to executives. Oliva also said that Whedon's finished movie did not match the story narrative that Snyder intended to tell in his movie. There is still a lot of attention being paid to Justice League. It definitely should have been a bigger, better movie. Little pieces of what could have been are slowly being leaked to fans. But it will be a surprise to everyone if an actual alternate cut of Justice League actually appears. Some believe Zack Snyder will show off a trailer for the Snyder cut at Comic-Con. Though, that rumor has also been called nothing more than clickbait.